Will this pumpkin and this squash cross-pollinate? Will buttercup squash cross with jack-be-little pumpkin? The buttercup is maxima species and the pumpkin is pepo species. Re: Will this pumpkin and this squash cross-pollinate? It is unlikely but not impossible. In general, part of what makes things different species is that they don't naturally interbreed (cross-pollinate). But it has happened that within Cucurbita family some cross-species cross pollination has happened. HOWEVER, that would not affect the fruit you get this season, only the seeds inside those fruits. So if your plants did by a long chance cross pollinate you will still have buttercup squash and pumpkins. 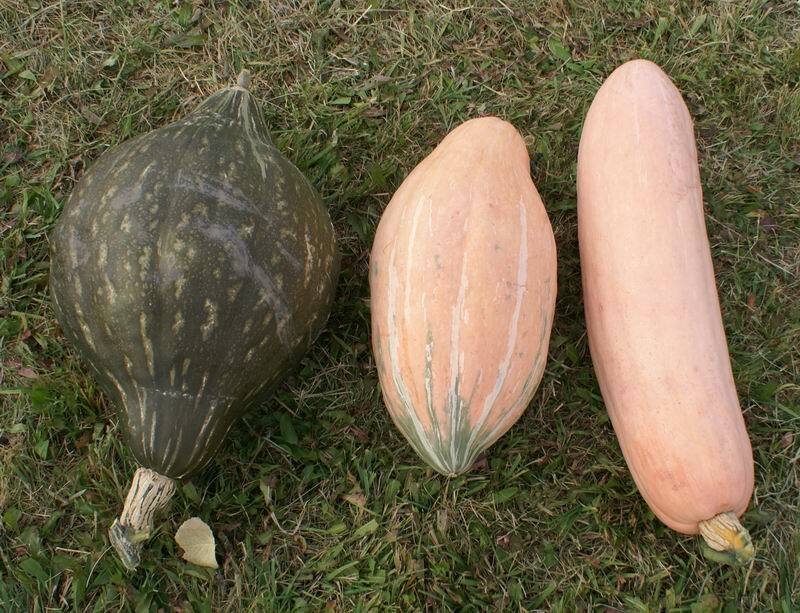 But if you saved the seeds from them and grew them out next year, you could possibly have a squmpkin. I am going to say NO! I have never had pepo cross with maxima in my garden. I am not absolutely sure it is impossible, but it is highly unlikely. This year I am only growing one maxima, It is Red Kuri. I wanted to only grow the one maxima so I could save the seeds and be assured they came true to form. I will have to wait until next year's harvest to report on the success of that venture. I do have loads of pepo squash planted so the opportunity will be there. We will see. I know the maxima varieties freely cross with each other. Here is a pic of two parent types and a cross. Hubbard and Banana. The hybrid was a tasty squash. Point is, you may get a cross, but its still squash. I planted several of the hybridized seeds (maybe 12) and the fruit all came the same. No indication that the plant had crossed with anything in the pepo line. To go a little further, I do have honey bees so the pollen no doubt gets spread around. Now off to weed the onions. jal_ut wrote: Here is a pic of two parent types and a cross. Hubbard and Banana. So would that be a Hubbana or a Banubbard? Guess I should report on the Red Kuri. (first season for me) Yes, it did produce some fruit. Yes, I was disappointed on the size, they were small, about the size of a softball. Here I was expecting something like a Hubbard. Then I was not fond of the flavor either, very bland. I put some on my table at market and none have sold. The bright red color may make good decorations? I don't suppose I will grow Red Kuri again. Not much going for it. Can any of my plants cross-pollinate? Cross pollination of Courgette (Zucchini) with Pumpkin?